Tan Towel On The Glow - 200ml Daily moisturizer contains DHT and erythylose to gradually build your tan without ever stepping foot in the sun. 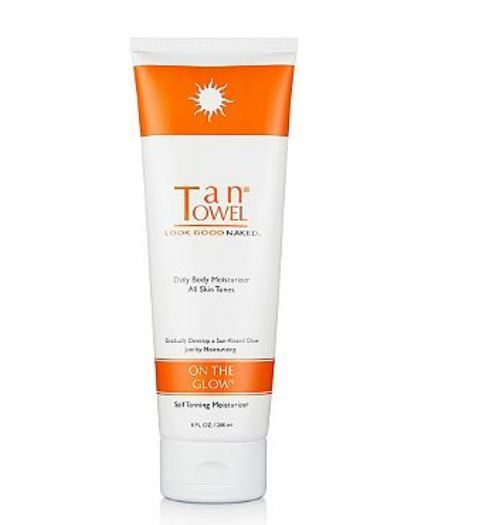 On The Glow Self-Tanning Daily Face Moisturizer by Tantowel hydrates and protects your skin with a blend of jojoba, avocado, olive oil and oat kernel extract. Retinol offers anti-oxidant benefits and maintains a healthful complexion. Apply evenly over face allowing several minutes to dry. Wash your hands immediately after application. Use daily for best results. Water (Aqua), Glycerin, Prolatum Oil, Glyceryl Stearate, Dihydroxyacetone, Cetearyl Alcohol, Ceteareth-20, PEG-100 Stearate, Petrolatum, Dimethicone, Cyclopentasiloxane, Simmondsia Chinesis (Jojoba) Seed Oil, Retinol, Persea Gratissima (Avocado) Oil, Olea Europaea (Olive) Fruit Oil, Erythrylose, Citric Acid, Cetyl Palmitate, Cetearyl Isononanoate, Cetearth-12, Carbomer, Caramel, Calendula Officinalis (Marigold) Flower Extract, Avena Sativa (Oat) Kernel Extract, Polyquaternium-37, Propylene Glycol Dicaprylate/Dicaprate, PPG-1 Trideceth-6, Fragrance (Parfum), Sodum Hydroxide, Phenoxyethanol, Methylparaben, Ethylparaben. This product does not contain sunscreen and does not protect against sunburn. Repeated exposure of unprotected skin while tanning may increase the risk of skin aging, skin cancer, and other harmful effects to the skin even if you do not burn. For external use only. Not to be swallowed. Avoid contact with eyes. If signs of irritation or rash appear discontinue use and consult a doctor.